Moscow is concerned about the demographic decline which negatively affects the country’s geopolitical, economic and military potential. Though the Russian population is not threatened with extinction in the foreseeable future, the media often describe the country’s demographic situation as difficult or critical. The labour force is said to be declining by 800 thousand workers every year. Immigration could be a solution but for a disproportionately high number of umie educated people among foreigners. A brain drain is yet another problem that the government needs to deal with.1)25 лет спустя: демография после развала СССР, Настоящее Время 2016.Certainly, pension expenditure will have to be increased because of the growing number of seniors or pensions will have to be reduced. There could arise a need to levy a higher income tax and extend the retirement age. As for now the authorities are focused on encouraging families to have children. Since 2007 the authorities have been providing a one-time benefit in the form of certificate that can only be used for particular goods or services, adjusted annually for inflation, to mothers who have more than 1 child.2)The benefits of being a Russian mother, Russia beyond 2015-08-24.In the same year the government set September 12 as the National Day of Conception, a day off from work for couples. It was hoped that 9 months later, on June 12, Russia’s National Day, there would be a bumper crop of children, and it was, but only a few times. Women who gave birth on that day could win refrigerators, money, or cars. Parents with 7 or more children are invited to the Kremlin and receive medals from the president himself.3)Why Putin is paying women to have more children… Inside Russia’s super families, The Telegraph 2017-03-10.The positive result of that action was only achieved in 2013.4)6 creative ways countries have tried to up their birth rates, Mental Floss 2016-05-11.The authorities realize that the demographic problem can only be solved by strengthening the family.5)Демографическое будущее России: депопуляция навсегда?, Библиотека учебной научной литературы. True, there are many nations in a worse demographic situation, yet Russia is a case apart due to the epochal event which was the 1991 disintegration of the USSR, of which Russia was the largest part. The population of the Russian Federal Soviet Socialist Republic increased from 87 million in 1922 up to 148 million in 1991 and remained at that level until 1996, after which it started to decrease. From 2009 the situation seemed to be improving slightly until last year, which was predicted by some economists because about the year 2010 women aged 25-30, i.e. those with the highest fertility rate, made up the biggest age cohort.6)The Russian economy in 2050: Heading for labour based stagnation, BROOKINGS 2015-04-02.There is a high possibility that in 30 years the population will drop by over 10 million and by 2100 it will have decreased by the same number. By 2050 Russia will be the 15th most-populous country, following the Philippines and Tanzania.7)Western Sanctions Are Shrinking Russia’s Population, Foreign Policy 2017-10-19. Already since about 1983, a few years before the end of the Soviet Union, the birth and fertility rates had been decreasing, which was one of the earliest signs of the coming crisis. After 1991 the number of deaths surpassed that of births: 12,2 as opposed to 10,7 per 1000 people respectively. In 2000 1,2 million children were born and 2,2 million people died. Until 2012 the number of deaths had remained higher than that of births. Then the birth rate began to slightly exceed the death rate but only until 2016. In 2017 in each month there were 10%-15% fewer births than in 2016. The data from January to August of 2017 show that there was a loss of above 100 thousand people. At present, in Russia one birth occurs every 18 and one death every 16 seconds, so again more people die than are born. The fertility rate is about 1,7. In comparison to many other countries this is a relatively good result, but still below the replacement level. Right after the collapse of the USSR, significant numbers of people, mainly Russians, from the former Soviet republics (Kazakhstan, Ukraine and Tajikistan) kept arriving in Russia.8)Что стало с русскими в союзных республиках после развала СССР, Рамблер 2017-06-11.This immigration compensated partly for the numerical decline in the society. According to the Federal Migration Service, in 2008 in Russia there were 9,2 million foreigners, 80% of whom came from CIS countries and about 60% worked illegally. In the 60’s of 20th century people aged 65 and over made up 6% of the society, in 1991 – 10%, and now almost 14%. In the same time the number of children (aged 0-14 years) dropped by 13 percentage points, so it is clearly visible that society is aging. The population aged 15-64 had been shrinking till 1991 and then started growing until 2015. The Russian Federation’s life expectancy is low: 70,91, while for example the US boasts 78,84. There are many causes behind it. Some of them are related to the means taken by Boris Yeltsin (First President of the Russian Federation) and then by Yegor Gaidar and Anatoly Chubais (First Deputy Prime Minister and Deputy Prime Minister of the Russian Federation respectively), who were in charge of the country’s social and economic transformation. Widespread unemployment, rampant inflation, empty shops made people feel insecure and discouraged them from starting a family. At present every fifth Russian does not want to have children. Psychologists investigating this topic think that now people are unable and unwilling to share life with someone else and compromise their own habits.9)Почему так много людей не хотят вступать в брак, заводить детей? Ответы психолога, Первый канал 2010-02-25.For 100 marriages 80 end in divorce and because of that young women are afraid to be abandoned or become single mother. Moreover some of them, in particular from the middle class, are scared to lose attractive appearance, personal freedom and independence. Over the last 10 years educated and wealthy women have become increasingly childless, while these not educated give birth more often.10)Чайлдфри: почему женщины не хотят рожать, Mиp24 2016-04-12.Professional career can hardly be reconciled with having a family. It is believed that people have to make a choice between children, lack of self-development and poverty or vice versa, with nothing in between. According to VCIOM (Russia Public Opinion Research Center) about 10% of Russians do not have enough money to buy food. The number of people living in poverty grew from 15,5 million in 2013 to 19,8 million in 2016. So they cannot afford babies if they want to raise them in good conditions so much so that childcare facilities are few. Russia is facing a bigger problem than the low birth rate: its death rate which stands at 13 per 1000 people while the world’s average is about 8, in US 8, in UK over 9. After the collapse of the USSR the death rate has increased largely due to alcohol abuse and suicide. At that time people were pushed into economic dire straits. A factory closed overnight, no financial resources to start a business, no potential customers for existing enterprises. The Yeltsin era was war in slow motion, razing the country to the ground, as it implemented the West’s advice. The economic crisis hit the Russian health care system. There occurred diseases that are not even found in many Third World countries: diphtheria, typhus, cholera, typhoid, and especially tuberculosis. Mortality due to TB is dropping but still there are 320 new cases and 64 resultant deaths each day. The problem most often concerns men (infected women make up less than 50%), aged mainly 25-34 years. The major causes are bad living conditions, no treatment, late detection, insufficient number of medical laboratories, and low infection control. Tuberculosis hits primarily the homeless, unemployed, migrants, and drug and alcohol addicts. 11)Tuberculosis country profiles, WHO 2017-12-01. More than 30% of all deaths in Russia in 2012 were alcohol-related: ethanol poisoning, cirrhosis, accidents. The total consumption of pure alcohol in litres in 2010 was 32,0 for men and 12,6 for women, (average 22,3) whereas in the US at the same time it was 18,1 and 7,8 (13,3) respectively,12)Russia is quite literally drinking itself to death, QUARTZ 2015-05-13.which results in a rising mortality among men aged 50 and less. Russians are not only addicted to alcohol but also to drugs, mainly heroin. During the Soviet era, the country was not a significant consumer of narcotics but the situation has changed since the beginning of the new millennium. Between 1996-2006 the number of drug users increased tenfold. Now about 8,5 million Russians abuse illicit narcotics and 90% of them use heroin. One of the by-products of this phenomenon is the world’s fastest-growing HIV epidemic that affects a third of the drug addicts. In 2015 Russia recorded almost 100 thousand new HIV infections and in the following year about 1 million. Each day there are 80-100 HIV infection cases among women.13)HIV and AIDS in Russia, Avert organisation 2017-06-13. Another big problem is abortion. It is quite common and used for birth control. There are 480 abortions per 1000 live births (while in US 200, in Germany 135). It is a legal procedure up to 12th week of pregnancy and in special circumstances at later stages. In 1920 the Russian Soviet Republic was the first country in the world to allow abortion under all circumstances. Now abortions in Russia are available as a part of free health care package of mandatory medical insurance and every insured woman aged 16+ can request a free pregnancy termination.14)Putin’s next target is Russia’s abortion culture, Foreign Policy 2017-10-03.At the end of the 1990s officially there were 3 million abortions annually per 1 million births whereas according to unofficial estimates the number was 5-6 times greater. Until 2007 the number of abortions was higher than the number of live births. W 2008 there were 72 terminations of pregnancy per 100 births compared to 20/100 in US. Hand in hand with pregnancy termination many children – in 1993 5% of newborns and 5 years later 9% – are abandoned after birth. At the end of 1990’s there were about 1 million homeless children.15)Демография в России (1897-2030), Dissonnace.ru 2010-09-13. 1. ↑ 25 лет спустя: демография после развала СССР, Настоящее Время 2016. 2. ↑ The benefits of being a Russian mother, Russia beyond 2015-08-24. 3. ↑ Why Putin is paying women to have more children… Inside Russia’s super families, The Telegraph 2017-03-10. 4. ↑ 6 creative ways countries have tried to up their birth rates, Mental Floss 2016-05-11. 5. ↑ Демографическое будущее России: депопуляция навсегда?, Библиотека учебной научной литературы. 6. ↑ The Russian economy in 2050: Heading for labour based stagnation, BROOKINGS 2015-04-02. 7. ↑ Western Sanctions Are Shrinking Russia’s Population, Foreign Policy 2017-10-19. 8. ↑ Что стало с русскими в союзных республиках после развала СССР, Рамблер 2017-06-11. 9. ↑ Почему так много людей не хотят вступать в брак, заводить детей? Ответы психолога, Первый канал 2010-02-25. 10. ↑ Чайлдфри: почему женщины не хотят рожать, Mиp24 2016-04-12. 11. ↑ Tuberculosis country profiles, WHO 2017-12-01. 12. ↑ Russia is quite literally drinking itself to death, QUARTZ 2015-05-13. 13. ↑ HIV and AIDS in Russia, Avert organisation 2017-06-13. 14. ↑ Putin’s next target is Russia’s abortion culture, Foreign Policy 2017-10-03. 15. 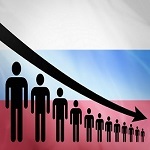 ↑ Демография в России (1897-2030), Dissonnace.ru 2010-09-13. Prev: Will France be the first European country with a Muslim president?